and what happened in brief. First treaty ceding land to U.S.
5,000 Sioux storm Upper Agency warehouse. Lower Agency and wharehouse plundered. Troops ambushd at Redwood Ferry. or New Ulm. 100 warriors fired on New Ulm. Little Crow, 400 warriors hit Fort Ridgely. 14 are massacred at Lake Shetek. The upper Agency is destroyed. Indians withdraw from New Ulm. 2000 refugees move to Mankato. as they bivouac for the night at Birch Coulee. The battle lasted 31 hours. Little Crow's Message to Sibley. 38 Indians hung at Mankato. 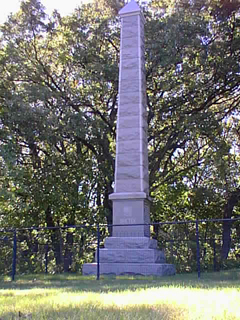 The book "MONUMENTS AND TABLETS ERECTED BY THE MINN VALLEY HISTORICAL SOCIETY"